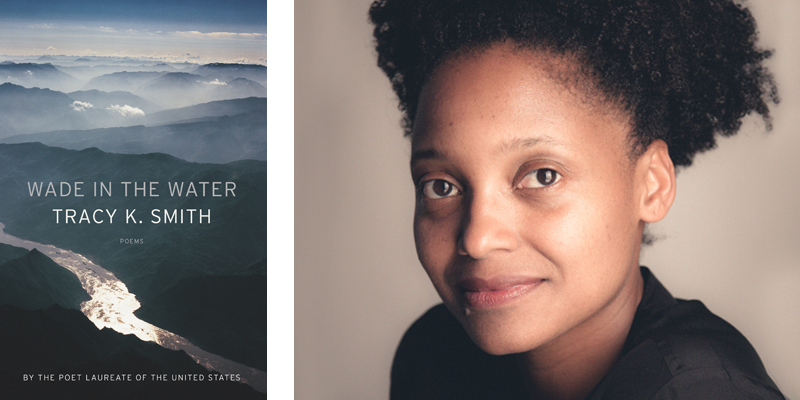 Every book Tracy K. Smith has published has won an award or received an honor. Her first book of poetry, The Body's Question, won the Cave Canem Poetry Prize; her second, Duende, won the James Laughlin Award; and her third, Life on Mars, upped the ante and won the Pulitzer. Her memoir, Ordinary Light, was a National Book Award finalist (as well as one of our 25 Memoirs to Read Before You Die). And of course, she has just begun her second appointment as United States Poet Laureate. Which begs the question: What's in store for her new book of poetry, Wade in the Water? If you know Smith's work, it's not surprising that she's so critically acclaimed. Her combination of honesty and lyricism, engagement and imagination, is rare and refreshing. Her poetry and prose are both clear and gorgeous, and she considers and explores issues of race, history, family, loss, desire, and citizenship in such an enlightening and incisive way that her work feels utterly crucial. Jill Owens: First of all, congratulations on your second term as Poet Laureate! Tracy K. Smith: Thank you. Jill: What did you find most surprising or challenging in your first term as Poet Laureate? Smith: I would say it's definitely surprising that it's been easy. I thought it might not feel like an easy thing to do. What's been surprising is how much people have welcomed me into these different communities, people who are not even necessarily readers of poetry. I've been traveling to rural communities in different parts of the country in the hope that the conversation around poetry might be a way of bridging some of the ideas of division that we are often talking about publicly and in the media. I didn't know what it would feel like, if there would be skepticism or if there would even be interest. But people have been so beautifully hospitable and eager to talk about poetry, eager to connect. A lot of people who are coming to these events are coming because they live in a small town and it's something that's happening, so they're curious. Other people are coming because they feel like maybe they want their kids to get a sense that someone who looks like me or like them can be in a position like Poet Laureate and do something on a national scale. It's been really beautiful. I hoped for a sense of community to happen in each of these places, but didn’t know if it was possible. It's been different in each place, but something really warm has taken shape. Jill: What would you like to do differently or to do more of in your upcoming term? Smith: I'd like to continue to do this: I took three of what we've called “pilot trips” over the last season. We've tried different things out in each place. One of the things that we hit on is doing something that is broad and open to the public and doing something that's a little bit more targeted or curated. In Bowling Green, Kentucky, we visited an addiction rehab center, and met a group of over 115 men who are living in the center most of the time, dealing with having to get over an addiction. I'd like to do more things like that. I'd like to present to an aged community. I'd love to see if poetry could speak to maybe teens or young people who are dealing with mental health issues like depression or anxiety. I feel like it would be really exciting, where there's interest or where people think poetry might feel useful, to go into places where there might not otherwise be access. That's one of my favorite things to do, is be on the end of shaping, trying to make a journey, and trying to fill in what's not yet been written. Jill: In a statement about poetry in Publishers Weekly, you said: "Poetry invites us to listen to other voices, to make space for other perspectives, and to care about the lives of others who may not look, sound or think like ourselves." I was thinking about that in the context of the voices in your found poem, "I Will Tell You the Truth About This, I Will Tell You All About It," which is composed entirely of letters and statements by African Americans in the Civil War and their widows and children. How did you come across these source texts, or how did you decide to highlight these particular voices that we don't hear very often? Smith: That poem came about as the result of an invitation. There was an exhibition of Civil War photographs at the National Portrait Gallery a handful of years ago, which were shown to commemorate the 150th anniversary of the beginning of the war. They asked a number of poets to contribute poems to the catalog. And I thought, Oh, gosh. I've never really gotten into the Civil War. I really didn't like, sometimes, the conversation that takes shape around it. Like, was it about freeing slaves, or was it about something else? I thought if I could find some voices of black people who were involved in that conflict, I could find my way in. I didn't know what would be possible, but I found two books. One was called Families and Freedom and I forget the title of the other one. They were two books that had a lot of these primary sources. There were letters and testimonies that people had given in depositions after the war, or that their widows or their children had given in an attempt to get pensions. I remember spending several days just reading. I wasn't sure what my poem was going to be like. I wasn't sure how it would be structured, what stance it would take. But I figured I would educate myself a little bit about these experiences. And then the more I read, the more I realized there was nothing I needed to add. It was a matter of curating a chorus of these voices that I could invite a reader to listen to with me. They felt so beautiful and so full of dignity, and also so hopeful that institutions, that the presidency, or even just the fact of American democracy could work for them despite everything. That seemed so urgent. That poem kind of lived on its own for years. More recently, when I was coming back to writing poetry and thinking about a book, it was something that I wanted to make a central space for. It's asking so many of the questions that we've been dealing with publicly about race and tolerance or acceptance of others, however you define that. [That public conversation] feels relevant to what these people were saying, and what their experiences have borne out. Jill: So many of the poems in Wade in the Water feel both timeless and extremely relevant. Some of them are taking things from more recent events. You're obviously always responding through poetry to things happening in the world today, but I wonder if you feel like you’re responding or engaging differently in recent poems than in your earlier work? Smith: I think so. The questions [in my recent work] are consistent with questions I ask in my earlier books, but I think in the last couple of books they're coming from a different place. I'm really trying to figure out what I can do. Because now I have children, and before, I did not. I'm trying to figure out if writing poems can teach me to be more compassionate, and if writing poems can teach me to at least believe in other people and the sources of urgency that they live with. I guess I'm also thinking, Oh god, I want my children to inherit a world that's safe, and kind, and somehow working through these questions. It feels like the kind of practice that might be offering something to their world even psychically. I don't really know how else to say it. The stakes feel different now. It's not about me, my intellect, or my opinion, or even my skill. It's about — we live with these problems, we live with these questions. I think it's our job to try and process them as much as we can. Jill: You mentioned in an interview with the Berkley Center at Georgetown University that this book was about compassion, to some extent. You were talking about it in the case of the title poem, “Wade in the Water.” I was wondering if you would mind sharing the story behind that poem with our readers. Smith: No, I love sharing that story. It's so unbelievably beautiful, I think. I was doing research in coastal Georgia for an opera project that I'm working on about land ownership and stewardship there, particularly land that has moved from being plantations where blacks were enslaved to land that those former slaves purchased from the government during Reconstruction and have held onto through generations. There's a strong sense of culture and tradition connected to these places. The islands are somewhat isolated from the mainland, and so the people who were enslaved there could exercise a little bit more autonomy in terms of their cultural practices. They had a little bit more privacy from the plantation owners, who would go away every summer. So the traditions there have a lot of resemblance to West African traditions, in terms of praise, and ceremony, and music, and language. I had been visiting a lot of places with a heavy shadow over them. There were a lot of emotions that I was processing. On my last night, I went to a ring shout, and one of the performers was a really beautiful woman named Bertha McKnight. She said, “I love you,” to me as she walked past me in the entryway, and she gave me a hug. I felt so touched and seen by that gesture. And then she said it to the next person, and the next person, and the next person. She said it to every single stranger that she met that night, and it didn't feel like a shtick. It felt like a genuine offering. I went home thinking about that night, thinking about the voices, and the songs, and that feeling of love that characterized that whole encounter. I wanted to dig into it in another way. So the poem, "Wade in the Water," attempts to narrate that scene, but it also allows, I think, from the rhythm present within the poem, to guide me into associations. Like the subtext — well, of the song "Wade in the Water," but also that sense of living history, or history that hasn't quite been fully confronted, that is not quite finished with us, that lives in these places where there was this awful institution that was perpetuated. At the end of that poem there's a kind of catalog, "O Woods, O Trees, O Dogs, O Gun," and suddenly I'm thinking of escape — and thinking of the perils of trying to gain your freedom when everything that was officially in place was designed to prevent that from happening. I'm really trying to figure out what I can do. Because now I have children, and before, I did not. Jill: Thank you for sharing that. It's such a beautiful and moving poem. When you were talking about the connection between people and trying to love each person, it reminded me a little bit of "Political Poem" in this book, too — the image of the mowers passing along a connection or a message, creating a moment. As you say, a common understanding. Then you end with "Their work would take forever….but I love how long it would last," which is a really powerful image. I didn't know if that evolved from a similar thought process. Smith: I came to understand that poem in similar terms. When I wrote it, it was an anomalous thing that woke me up one night. I was imagining in a dream that I was reading a poem aloud. In my dream, it was a poem by Carl Phillips. As I was dreaming, I said, "That is not a Carl Phillips poem. [Laughter] You need to wake up and write this down." So that's what I did. It used to be called "The Mowers." Then, after I read it a few times, I thought, I think I know what this poem is really about — this sense of what would it feel like if we were watching and listening for each other. The idea of calling it “Political Poem” felt sort of satisfying because that kind of a title sets up such a rigid expectation, such a prescriptive dogmatic kind of expectation. But the poem is sort of strange, surreal, and also so hopeful for something that's not realistic, sadly. The next poem in the book is called "Eternity." Quietly, to me, that's a little way of underscoring where my hope for that poem is. "I love how long it would last," and then you turn the page and the next poem you find is called "Eternity," which is a timeframe that I'm also really interested in. That word comes up a few times. Part of what I've been trying to ask myself to do is think, OK, we belong to the history of the centuries that we span, but we're also part of something enormous. What if we think about our actions as having some bearing upon the history of eternity? What would we change if those were the stakes that we were cognizant of? Smith: That's the only dream like that that I've had. It was so strange. I dreamt that I was in a hotel where there was a mural of that poem, which was by him, painted on a wall, and I was reading it aloud to somebody who was with me. Jill: That's a really cool origin story. Speaking about eternity, and also the sacred, the whole first section of the book has sacred or religious imagery combined with the everyday. There’s a shop called Garden of Eden, and angels, who are described like Hells Angels in a hotel room, and then God climbs out of the cab of a truck in "Hill Country," which I love. Jill: Is that part of what you wanted to explore about eternity, in terms of situating religious imagery and characters in the everyday? Smith: It was almost less elective. I think — I don't even know how to say it. The sense of the holy… it's one of my obsessions. Even in my last book I was trying to fashion things that I could live with that spoke to that urge I have, but I didn't want it to be the framework of God that I had received. It seemed like that was too finite. So Life on Mars is really about trying to make God into something that's on the scale of the universe, something that's that vast. This book is maybe doing that by making things as grounded in the earthly as possible. It must just be my habit. I don't know why. I also feel like leaving New York City a few years ago and moving to Princeton, where — it's not rural, but there's a lot more nature and wildlife that I live with — it's a lot quieter. I see the seasons differently. I see my children interacting with them and the natural world differently. So I think it's almost involuntary. In that poem, "The Angels," the end is all of these things I see. And I'm scared for a little bit, because I think it's a powerful living force, but it's just a rock, or it's just a pipe. That living force field is holy in a way. In some ways, I think I'm working out this question I have about an idea or wish for something like universal oneness, or something that says I'm connected to that living force that I see all around me, that scares me a little bit. Jill: Another poem in that section that I loved was "A Man's World," in part because it feels dead-on accurate [laughter] and it's funny. Is there a story behind how that poem came to be? Smith: That's an old poem, actually. I probably wrote it while I was working on my second book, or maybe right after. I can't remember exactly. It didn't fit into the cosmology of that book. I came back to it when I was looking through the new work that I'd produced. It was called something else. I compressed it a tiny bit, and it felt like it wasn't just me that I was describing, awful encounters that I've had as a woman in the world of men. It felt more archetypal. I made the frame a little bit tighter and pushed a little harder with the title. It felt eerily relevant, the more time that went past. You're making something that eventually has its own volition and is asking you to make the choices that it needs you to make. Jill: How do you think about your collections as you're working on them? Do you have a sense that there are themes emerging, or are you working poem by poem, and then arranging them later as you see the connections between them? Smith: I'm telling myself that I'm just working one poem at a time, but inevitably a theme will catch me up. There'll be a few poems that seem to be working in one direction, and then I'll say, Oh, that's a fruitful direction. I want to keep looking at it. Let me find other ways of doing that, and so then these concerns get set into place. I still will say to myself, Don't worry about that. Just write. Just write. And then I'll get to a point where I have a hefty body of work. To me, the number is about 53 pages. That's my lucky number. [Laughter] When I have about 53 pages of poems, then I say, OK, I'm not going to kid around anymore. I know I'm writing a book. What is it about? That's where the poems get divided up. I'll say, OK, here are these piles of poems that are saying different things. I can't have a book of just piles of poems, so what are they saying to each other? How can I shape that conversation across themes? The really exciting question is what's missing. What do I need to write in order to solidify the sense of what this book is looking for? That's one of my favorite things to do, is be on the end of shaping, trying to make a journey, and trying to fill in what's not yet been written. Jill: Your language is gorgeous; I marvel at how you combine sound, sense, and image. There are too many examples to try and find one. From "Minister of Saudade”: "Lap and drag. Crag and gleam. / That continual work of wave / And tide, like a wet wind, blowing / The earth down to nothing." Or in "Dusk": “She left untouched, food I'd bought and made / And all but ferried to her lips, I could see / how it smacked of all that had gone slack / And loose in me." You've got such great internal rhymes, and assonance, and alliteration. My question is: Do you let yourself be pulled along by sound? Is that how you find the next word? Or do you have a more organized idea of what you want to convey, and how you get from the first image of the poem to the last? Smith: It's completely unorganized. It's completely feeling my way through by saying, OK, I don't know what to say. What did I just say? Let me listen and see what I just said, and then see if there's a sound or a set of sounds that can be fruitful that might indicate what I should say next, what word sound to lean on; or, is there an image that I can invest in for a few more lines, to keep going? Those are the things I feel like I'm doing, and then maybe if I do those two things I'll have another idea. It's really just feeling through the poem blindly, but being as attentive as possible to what just happened. That's what makes it so exciting. That's when I start feeling like, Oh, the poem knows. If I can listen to what the poem says, it will tell me what it needs, which is a language that I always received in workshop when I was in graduate school and college and that I loved. You're making something that eventually has its own volition and is asking you to make the choices that it needs you to make. Jill: The last poem, "An Old Story," might be my favorite poem in the book (though that's a hard thing to choose). The end of it is so blunt, strange, and hopeful in a way that I really like. Smith: As I've now read that poem aloud a few times at readings, I think it's a poem that's attempting to write a new myth. The tone — it feels like a poem that wants to have a mythic tone. The poem begins in such a bleak place and finds something that seems like it could be generative. I needed a poem to do that. I needed to find a way to feel whole. Jill: In the introduction to your first book, Kevin Young said about your work that the "body here is holy, as is its shadow; Smith doesn't divide the two… she sees the dark and the light together." Do you think that is still an accurate, or useful, description of your work? Smith: I hope it's still useful. I love that he saw that in that book. I think that I like to be honest about my limitations, or my sense of the "us" that I belong to — and about what the barriers to wholeness or brightness are, because those are part of us too. In a poem, I feel brave enough to explore that. I feel brave enough to claim some of my own flaws, but also more than flaws, just the ways that I'm somehow complicit in the very problems that I'm writing to signal. That feels like a fruitful kind of struggle to me. Jill spoke with Tracy K. Smith on March 30, 2018. Tracy K. Smith is Poet Laureate of the United States, and the Roger S. Berlind ’52 Professor of the Humanities and Director and Professor of Creative Writing at Princeton University, and lives in Princeton, New Jersey, with her family.